This is the fist time I’ve made mushroom pie. It came out great! I have some modifications in mind I want to try next time. Hence, trial #1 here. I got the inspiration and basic list of ingredients from Mamalakis’ recipe but I made significant modifications to fit my kitchen needs. Here’s how I made it. Find my ideas about next time in the notes. How to make: Chop mushrooms finely. Chop carrots finely. I made this late last night before I put the kids to bed and didn’t have time to do manual chopping or thin slicing, so I used a food processor. Prepare bechamel sauce: heat the butter in a large pot, whisk in the flour, add some salt and pepper. Add the warm milk gradually and keep mixing with a whisk. Add nutmeg to taste. When the bechamel acquires a creamy consistency take it off the heat. Give it a good stir to let some hot steam escape and fold in the eggs. Then add the Parmesan. More mixing. Then add the carrots and mushrooms and give it a final stir. Lay a puff pastry sheet in a pan, no butter needed. Pour the mushroom mix in and spread evenly. Lay the second pastry sheet on top. 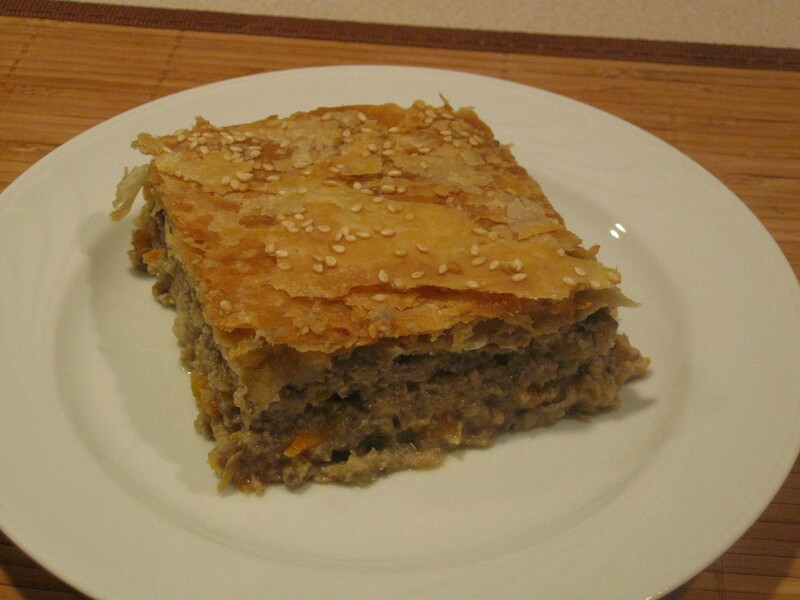 Fold at the edges and pinch where the bottom and top sheet meet with a fork (see photo) . Sprinkle some drops of water on top and then, optionally, sesame seeds. 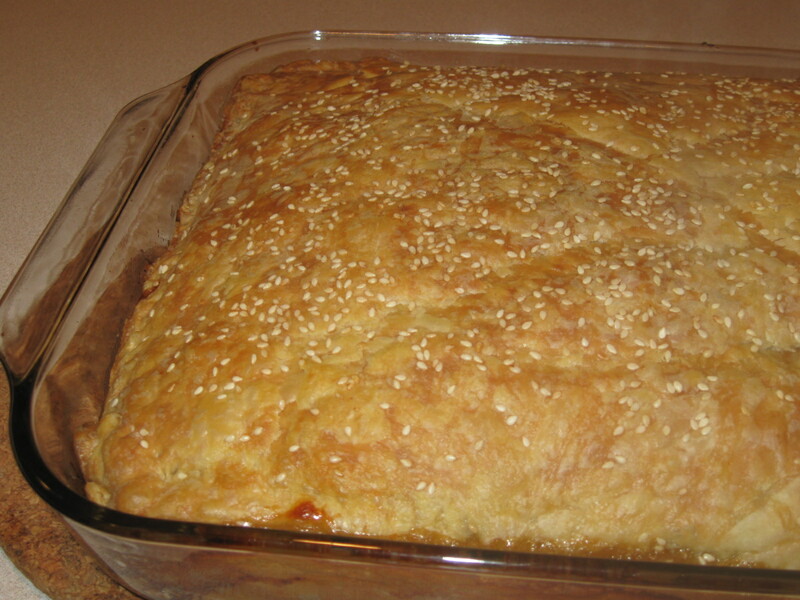 I love sesame seeds with pies! Cook in a 375 F – 190 C oven until it browns, about 50-60 minutes depending on the oven. Notes: Next time I’ll make the mushroom mix creamier. I’ll try making the bechamel thicker adding more butter and flour and using shredded cheddar instead of Parmesan, adding more salt in this case. Shredded cheddar (indeed Greek `kaseri’ ) was the cheese of choice in Mamalaki’s recipe but I only had Parmesan so I substituted this time. How bad can you go with Parmesan in a pie? Not at all, but, as I said, I’m curious to try a creamier version. If I have time, I might as well shred the carrots, thinly slice the mushrooms and cook them in a pan for a few minutes until the liquid is gone. That’s instead of using a food processor that practically mashes them. That, too, was in the original recipe. And then I’ll weigh the taste benefits and let you know. Until then, try the speedy version I did last night and I promise you’ll have no regrets. Hmmm, saute the mushrooms and carrots with bacon! Nice alternative. So, you’re saying, switch to a stronger taste rather than a creamier taste. Not bad. I’ll try it.